1. 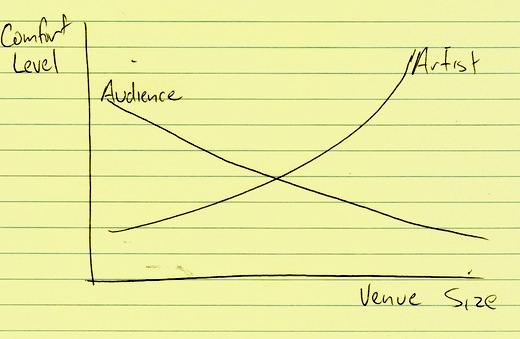 The better the venue is for the performer, the worse it is for the audience. 2. Hearing songs for the first time is a very different experience than hearing them a second, third, sixteenth or 64th time. Last night, I caught Them Crooked Vultures' debut NYC performance at Roseland Ballroom. Prior to the show, I had not heard more than a 30 second clip of any of their music. But a few factors convinced me to buy tickets for the show. The rhythm section comes from two of the greatest rock bands of all time (Led Zeppelin and Nirvana) and the guitarist/lead singer from a band that I appreciate and enjoy (Queens of the Stone Age). Aside from hearing a single, I went to The Raconteurs first appearance in New York with no more information than knowing the prior work of Jack White and Brendan Benson, and caught a great show. But I was only appropriately whelmed by Them Crooked Vultures. I suspect that the venue and familiarity kept this show from reaching the next level. Roseland is a pretty terrible place to see a concert. The sound is muddy and booming in the cavernous room. Any precise and dynamic bass playing just gets lost in the mud of Roseland's acoustics. Fortunately, John Paul Jones plays with a fairly distinctive sound that helps emphasize the attack at the beginning of each note. The sightlines from the floor are atrocious. There's not enough traffic flow for the capacity this room can handle to make entering and exiting easy or quick. New York's other venues of similar capacity, including Hammerstein Ballroom, Webster Hall, Terminal 5, also present similar compromises to concertgoers, with boomy sound, crowded feeling at capacity, poor sight lines and insufficent bar staff to handle peak rush without queues. Which leads me to propose the hypothesis that there is an inverse relationship between a venue's quality of experience for performers as for audience. At a large hall like Roseland or Hammerstein, the artist has a proper dressing room, large stage, a dedicated sound engineer for the monitor mix, and space for a big lighting rig. But the audience has to deal with the hassles. At a small club with capacity of up to a couple of hundred, bands may lack a dressing room, someone to run lights, inadequate monitors and have to deal with the hassles of loading gear on and off stage through the crowd rather than directly back to a dedicated back-stage location, but the audience benefits from good sight lines and decent sound. The larger the artist is of a draw, the more the artist needs to be pampered and the audience will be willing to put up with more hassles. The smaller the artist, the more the audience needs to be made comfortable. At the intersection of the audience comfort and artist comfort curve is Bowery Ballroom along with other clubs of similar size. Big enough to have enough resources to put on a top-level show, but small and intimate enough to offer a good experience for the audience. There's a certain level of familiarity with a piece of music that makes it more enjoyable for a listener. The brain needs to do some amount of work to process music at first that listening to a song that one's heard before is a very different experience from listening to a new song. Stravinsky's Rite of Spring was so different and difficult, that the audience rioted at the piece's debut. Seriously, they rioted. And I can think of a couple of concerts I've seen the familiarity phenomenon in full effect. At the Raconteurs first show at Irving Plaza, The audience became significantly more engaged once the Raconteurs played the one single they had released to date, "Steady as She Goes." When U2 played a free concert in Empire-Fulton Ferry Park in 2004, the first 7 songs of the set were all songs from their new, yet-to-be-released album. It was very obvious to see who downloaded the album in advance from the internet and who hadn't. But the energy level of the crowded raised dramatically when the band broke into older singles, "Beautiful Day" and "I Will Follow." The audience was much more engaged and energized by hearing familiar material that U2 played the new single, Vertigo, again to feed off that energy to get a better performance for the film crew. By not releasing more than snippets of music, Them Crooked Vultures gave the audience something new, but not anything especially engaging. And because it takes mental energy to process new music, the crowd was sapped of a lot of its energy. The last time I went to a concert at Roseland was to see Radiohead nine (!) years ago. And all of the drawbacks of the venue were there, but the crowd had more energy, in part because Radiohead played a couple of days after their album dropped and also had old fan favorites to mix in with their new material. The first few songs of Them Crooked Vultures' set were all huge, riff-heavy energetic tracks that, as expected, combined the bombast of Nirvana with Zeppelin's grounding and Queens of the Stone Age sludgy grit. The last song featured an epic and heavy jam. But neither the songs themselves nor Homme's singing helped make the performance more than the sum if its parts. The biggest influence on the group's sound was Queens of the Stone Age. Which isn't necessarily a bad thing-- unlike some other groups assembled from members of other well-known groups, the parts here add up to something good and coherent. But it also lacked Nirvana's skill for songwriting and Zeppelin's heft and showmanship. As expected, Grohl is a formidable drummer. But you also see just how Jones' style works with Grohl's to give the rhythm section a taste of Zeppelin, but not attempting to mimic or ape the Jones/Bonham sound. NPR's Bob Boilen was very enthused with the band's show at the 9:30 Club, "It's been a while since I've been to a show that I'd call 'balls to the wall,' but Them Crooked Vultures aren't holding back. From their first song, 'Elephant,' to the song playing right now, called 'Highway 1,' nuance has left the building. Granted, I'm only four songs into the show, but good lord, this rocks." I suspect that at a club the size of the 9:30 Club as opposed to Roseland, the room didn't swallow up much of the show's appeal, which helped the audience enjoy the show that much more. Don't get me wrong: this was a very good show. Unfortunately, with a couple of tweaks, it could have been an epic show. This is now an annual tradition! For the second year in a row, we're going to look through the big list of bands coming into town this week for the CMJ Music Marathon and see if we can divine any trends in band naming. Go west, young man! All four of the compass directions are represented, but west is the most prevalent. Stereo is exactly twice as popular as mono! Black is again the most popular color represented, followed by gold. Light is slightly more popular than dark and shadow. Bears, birds, whales and dinosaurs, oh my! New and modern are much more popular than old, vintage, classic or historic. Republic is by far the most favored form of government and the Senate is the preferred representative body by this year's crop of bands. Surprisingly, no fans of direct democracy in the bunch. A surprising number of bands are either vampires or decided to use blood in their band names for some other reason. Does French Horn Rebellion have a french horn player in the band? Surprisingly, this roster features slightly more bands that are teams than there are bands that are bands. Hot is more popular than cold. Not surprisingly, loud is more popular. Big and small are tied at 5 apiece. Names in bold are bands we can definitely recommend seeing. Band names in italics are bands we would consider seeing just because their names are awesomely clever or ridiculous. See also Ear Farm's CMJ preview, which provides recommendations and information about silly little details like time and location. So this little venue in NYC, Madison Square Garden, hosted a small concert last night in celebration of the 15th anniversary of the Rock & Roll Hall of Fame. The bill featured Bruce Sprinsteen & The E-Street Band, Stevie Wonder, Paul Simon, Simon & Garfunkel, Crosby, Stills, Nash and friends. Perhaps you may have heard of some of these artists? So yeah. That was some bill. And the show lasted until 1:30 AM, as all of the performers brought out special guests, which included Bonnie Raitt, James Taylor, Jackson Browne, Dion DiMucci, Little Anthony and The Imperials, Smokey Robinson, BB King, Sting, John Legend, Jeff Beck, Sam Moore, Darlene Love, John Fogerty, Tom Morello and Billy Joel. Some of the collaborations made up for the extraneous or boring ones. Half of Stevie's guests were teh awesome. Jeff Beck came on stage to wail on the guitar for "Superstition." And it was tremendous. John Legend sang a competent version of Marvin Gaye's "Mercy Mercy Me" with Stevie. (That's a case where a competent version is a tremendous complement. Not an easy song to pull off, and while it didn't reach any higher ground, the song worked.) Legend also sat in on piano with Stevie to cover Michael Jackson's "The Way You Make Me Feel" for an emotional performance. Aside from an opening trip to "Woodstock," the Crosby, Stills and Nash set felt lightweight and superfluous to the rest of the night. All three were in fine form vocally, but I could have used another hour of Stevie and Jeff Beck jamming. Springsteen's choices of guests revealed much about his influences. Sam Moore showed how much of an influence he had on Springsteen as a performer and frontman. It also demonstrated that (with some extra horns) the E Street Band make for a solid soul revue show band. John Fogerty and Tom Morello showed a bit of the continuity of politically oriented rock music. By far, the highlights of Springsteen's set were the songs that Morello sat in for. I'm not a huge fan of Rage Against the Machine, so I had no expectations for Morello's playing (unlike, say, Jeff Beck.) His blistering solo on "The Ghost of Tom Joad" brought the song to a new level and helped elevate a cover of "London Calling" from acceptable to great. The interesting contrast between the two is where they took their music after their initial success. Springsteen became an outspoken advocate for the working class through song as stagflation gave way to Reaganomics. He delved deeper into the folk tradition with Nebraska and The Seeger Sessions. He released one of the most relevant and timely albums of this decade with "The Rising" and has continued to write new music. In contrast, Joel evolved from singing about disaffected teens to singing about disaffected middle age adults. His music remained personal, while Springsteen's evolved to add activism and politics to the personal. Joel may have said everything he has Perhaps that's why Joel last released an album of new rock music in 1993, Springsteen has released 6 new albums (3 with the E Street Band and 3 folk albums). And Springsteen still leads the biggest and baddest rock and roll carnival to roll through town. As a 60 year old, the Boss has more energy than most 25 year old indie rockers. Via The Star Ledger, Setlists for the show. This page contains all entries posted to Buzz Rant & Rave in October 2009. They are listed from oldest to newest.